Sword review of Darksword Armory's "The Guardian"
QUESTION: My question is simply if you will be doing a review on Darksword Armory's "The Guardian." I'm asking this because I've been looking for a two-handed sword that is strong and durable, but that also maintains a shorter and stockier build. From the reviews of the other swords offered by Darksword Armory, I don't think I'll be disappointed in the level of function. 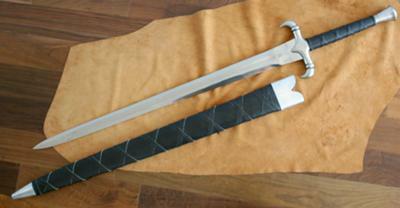 I'm also planning on buying the sword (if I do) through www.ArmsofValor.com becuase of the customization options, FYI. ANSWER: Yes indeed, a review is being prepared as to go live on the site as I type this email, probably should be up within the next 2-3 days. Comments for Sword review of Darksword Armory's "The Guardian"
I bought this sword through their eBay auctions. There's a major cosmetic problem with the throat of the scabbard. It's too wide, standing out quite a ways from the guard, and the metal throat is misaligned on one side causing a real eyesore. Also, this sword is very heavy and the center of balance is too far out for a sword as heavy as this one. It's a real wrist breaker. As far as structural integrity goes, I'm not sure because I can't do cutting tests with an unsharpened sword, and I'm not going to dry-handle something this heavy and unbalanced. It's got a very rigid blade, that's about all I can tell you. I was wondering about the weight of this sword, because there are some inconsistencies with the weight you and darksword have posted and the weight that my normal sword provider, Kult of Athena. Could you please clear this issue up? Gotta say, it's one beast of a sword! But, I do have some problems with it: first off is the weight of the sword is really heavy. I just don't see how this weight is practical if you are going to be cutting with this sword frequently. The other issue that I have with this sword is that every time I keep it in the sheath more than a few hours, (and sometimes minute's), the sword start's pitting and rusting!! This is the first time I've ever had this problem with a sword. I've had to go so far as to sand down the blade using progressive grade's of sand paper in order to remove the rust. This was very demoralizing for me, because it diminished the finish a good deal, and make's it so that I have to store the blade outside of the sheath--basically rendering the sheath useless. Overall I do feel that this item is a decent sword, functional on possibly anything you'd use it for; but I didn't really have that great an experience with my item. "This sword is too big for me!" One could say that you need to be strong to use this sword and most Darksword Armoury two handers. I'm stronger than the average joe, so that isn't really a concern for me. Perhaps a more accurate representation of the problem is that these swords are quite a bit thicker than they need to be, causing the sword to weigh more than is really necessary for a sword designed to be used. When you consider the steel, good forging techniques, and how these swords are built, I would think that Darksword Armoury could make their swords much lighter and still function as "beater" style medieval swords very well.